It is generally this time of year when people look back across the past 12 months to take inventory of either how good or how bad the year was in retrospect. 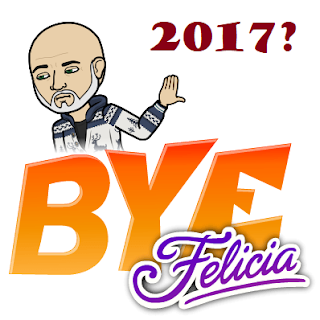 And I can honestly say that 2017 will go down in the books as one of the worst years - if not THE worst year - of my life. The bad news hit me on all levels - personal, professional, emotional. It affected my family, Kevin's family, my self-esteem and self-worth, and my future as well as the future of everyone in our country. I guess if the setbacks have to come, they should all come at once. 2017 did not disappoint. On a personal level, I experienced a great loss: my father passed away in July, finally yet quickly succumbing to his 7+ year battle with Alzheimer's. His death has left a noticeable hole in our lives that we all still struggle to fill. And while his absence at family gatherings was something we had grown used to while he lived in the nursing home, it's all the more obvious now. And while I rarely called home just to talk to Dad, I at least always knew he was there if I wanted to do so. Dad was not a "phone talker". He would answer the phone and then put Mom on, yet sat down next to her to listen to the conversation and interject his opinions. And the more time passes, the more I realize that I very much have my Dad's personality: overtly gregarious and onerous when we were younger but becoming taciturn introverts as we aged. I will continue to miss him for the rest of my life. Also in July, my best friend since the early 90's died suddenly of a heart attack after suffering from an undiagnosed illness. Jeff was 55. We met in a bar the summer of 1989 and I decided that night that he was going to be my new best friend. And he was for the next 20+ years. We drifted apart over the last few years but the memories I shared with him are countless and still fill me with laughter. Back in February, Mom's older sister, Mary Lou, passed away. The following month, Kevin's cousin Riley died after a courageous battle with cancer. And earlier this month, I lost my last grandparent: my mother-in-law's mother, Grandma Davis. She died about a week or so after suffering a heart attack at the age of 95. All my biological grandparents were dead by 1987, when I was 21 years old. And I thought my days of having a grandparent were over at that point. But then Kevin came along and brought all 4 of his grandparents with him to the relationship. Grandpa Byrne passed away before I got the chance to meet him, but I did meet Grandad Davis a few months before he died. I remember Harry was impressed with my size, comparing me to the Olympic weightlifters that were on TV that summer of 2008. Grandma Byrne had come to Chicago to visit us and labeled herself "Grandma of the Future" when she created her own Facebook account. She was accepting and loving and deeply committed to her faith, as you expect any Irish Catholic grandmother to be. But Grandma Davis and I spent the most amount of time together. And she made no bones about the fact that she loved me and accepted me as her grandchild. The collective absence of these 4 people, which was completely unexpected at this point in my life, fills me with a warmth that can only come from having grandparents. And looking back, how lucky was I to have so many of them throughout my lifetime. At some point earlier in the year, I made a comment to Kevin that I wanted to start attending more funerals. That statement became a bit of a punchline, but my reason for saying it was that I more often would just send a card or flowers when I heard of someone's passing, but the more meaningful thing to do was show up and offer support and a hug to the person(s) who suffered the loss. It's the more mature, meaningful thing to do. I certainly didn't say it because I like attending funerals, but for all the ones I ended up attending this year (several friends lost parents as well this year) it made me feel like a better person for doing so. Add on to this the political climate we are all experiencing. We can all see how our government is corrupt and how our country is being led by a childish, Barnumesque demagogue who proudly boasts of sexually molesting women and preys on the concerns and feeds the fears of under-educated, myopic rural Americans. He has given permission for people to overtly express their hatred for one another while sullying the most esteemed and powerful position in the world. His actions and inactions will ripple through the American tapestry for years to come. And I expect the worst is still yet to come. He will continue to amass his own wealth while somehow convincing a portion of the population that he cares about them and is doing everything for them. This is all going to end very badly. And while all this was going on, I suffered through two traumatic medical situations. In April, I had my third sinus surgery to correct the mistakes made by the physician who conducted my first two surgeries in 2016. The final outcome was great, but for the first 4 months of 2017, my health suffered. Also during this time, I underwent extensive dental work, hoping to fix some of the sinus issue. It was an extremely emotional time for me. I was quite shocked at the level and amount of emotion I connected with my teeth. Both of these processes are well-documented on my blog, but suffice is to say that they contributed in a large part to my emotional unrest at the beginning of the year. The only saving grace through all of this, the only reason I remained as strong as I did over the last 12 months, is that my best friend was by my side through all of it. He made all of it bearable. How lucky that he married me 3 years ago? But for as bad as all these events were, there was still some light this year. Our family grew with the addition of two great-nephews, one being born just a few days ago. We traveled with family and got to spend more time with them. I experienced Disney with children. I stood inside the Coliseum. I walked Roman cobblestone streets in Pompeii. I climbed stairs in the Sagrada Familia. I journeyed into a cave in Slovenia. I walked through the gate of Nonnberg Abbey in Salzburg. I ate pizza in Zagreb and goulash in Budapest. I drank a a few pints and snorted mentholated tobacco at Oktoberfest. I stood in the parking lot where Martin Luther King Jr was assassinated. I visited Gays, IL. I've always been a person who relies on his calendar. I've kept personal calendars every year for the past 35 years. I know everyone's birthday off the top of my head. I've consulted my calendar for start dates to projects, jobs, and diets. I can look back at any point in the past 3+ decades and know where I was and what I was doing on any given day. So this upcoming transition from 2017 to 2018 will be a very big deal for me. I am looking forward to ending this horrible year and remaining open to the possibility that 2018 will bring more happiness and personal fulfillment. Very recent events in my life are already pointing to such. So a happy farewell to 2017, the likes of which I hope never to see again.